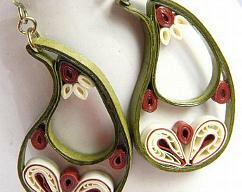 These awesome retro circles earrings are eco friendly and handcrafted by the art of paper quilling. I used three tones of green in different sized circles to create this striking pattern. 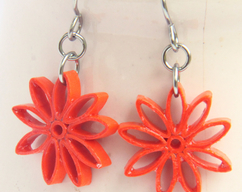 These earrings will elicit many compliments! Niobium earring hooks (non tarnish and hypoallergenic) finish the smooth and unique look. 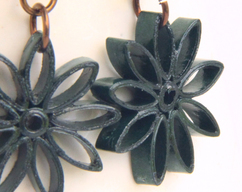 The green tones also make these excellent Christmas earrings! Each earring measures 2" (5cm) long and 3/4" (2cm) wide.